No doubt, iOS is the one best operating system with the enhanced features and it is even more powerful. This operating system includes enhanced iMessaging, beautifully redesigned maps and even more effective Siri. Not only this, there are many incredible features that iOS packs in it and it will take more than an article to say about it. So, you are impressed with iOS 10 and want it on your iPhone 5S or iPhone 6? Right? If so, then you are at the right place. Here’s how you can get the iOS 10 in your previous versions of iPhone. Check for the Software updates. For this, go to “Settings” > “General” > “Software Update”. When prompted, tap “Download” to download the iOS 10. Now, enter your Passcode, if prompted. Tap “Agree” to the terms and conditions. Tap agree again to “Confirm”. 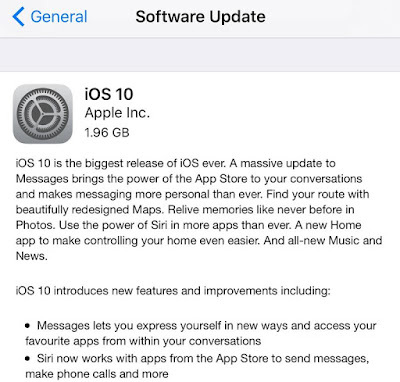 After following the steps, the downloading process on iOS 10 will begin automatically on your iPhone 5S or iPhone 6. Next story How To Fix 5 Common iOS 10 Problems on iPhone 7 Plus? Previous story How to Fix & Configure 3D Touch in iOS 10 on iPhone 7 Plus?